Saronai's Blog | The songs of my muse, the musings of my thoughts. Bean of the Light. Adventure Bean. Wandering Bean. Let Freedom Bean. Voice: Warm alto with only the hint of a draenic accent in common and orcish (less so in orcish/more practice). Basically, Nicole Beharie with a slight slavic accent. Appearance: Pretty much as-is in game. Metal accents on her gem-inlaid eyepatch are silver, not gold. Likewise, the decorative bands on her tendrils and tail are silver. Her hair is naturally curly (it’s a fantasy game shh) and may be frizzy or wild if it’s been rainy, she was training, similar things that mess hair up. In the way common to draenei, she prefers mixing art and culture in with utility and science. As such, her decorative armor is sturdy and protective. Covered eye is actually missing/scarred over and she has a large jagged scar on her left shoulder (provided she’s actually in something that shows off her shoulders). She has an expressive face, easy smile, and personable attitude. She wears two rings on her right ring finger. Both are of a simple silver band, one is set with a purple gem. Yes, I do hope she’d be this happy with the part. Shut up! Mannerisms: Easy going, easy smile, personable, and though she shares the same aversion to demonkind and warlock magics as the rest of her people, she’s generally more accepting, even curious about different people and their cultures and languages. As such, unless a warlock or demon are nearby or being talked about, she generally has the mannerisms of someone who’s paying attention to those around her and genuinely interested in their viewpoint. Her windswept adventurous spirit tends to show through as well, unburdened by what’s generally considered “proper” behavior. She touches the underside of her chin with the back of her fingers a lot while she thinks, may even tap it like that if she’s agitated, nervous, or excited. She will also press her lips together, sometimes licking them first, when waiting to say something or holding/biting her tongue. Work Style: Diplomatic and fair-minded approach. She tends to work at overcoming her own biases, even with people who make her uncomfortable. Often relegated to positions in need of mediation and field work as she prefers missions that send her afield where she can learn about new sorts of people. Personality: Free-spirited, caring, and curious person. She tends to be almost wildly independent, but also empathic. She doesn’t put a whole lot of store in tradition nor give to societal pressures on how she should act or think, even if that leaves her more friends among the outside races she befriends than with her own people. She will fight for the people she believes in and stand up for them as well as standing up to them if she believes they’re wrong, on a harmful path, or need someone to push back. Living Family: The last she saw any of her family, in both realities, was when she was tricked into leaving without her daughter (only a few years old), Sagara (Suh-GAH-ruh)back on Argus. They are all manari by now, as both parents, husband, and daughter stayed behind. Relationship Status: Engaged to Kadaan; probably heterosexual and heteroromantic, but possibly also demi-sexual, despite her recent whirlwind hookup. Religion: Nontraditional Light worship. More spiritual than religious. Unlike many vindicators (some of which are friends she’s been known to argue with about it), Isa solely believes in the light as life itself, in all forms. She sees her love of freedom, which makes her feel most alive, as a form of worship, making adventure a living practice and living life to its fullest, connecting with other life forms, all crucial ways of following the light. History: Alternate Draenor timeline. Isa had a relatively simple life back on Argus, getting married rather young and having her first and only child, a daughter named Sagara, within only a few years. When the time came to leave, Isa’s husband tricked her into leaving alone, without him or their daughter. She spent the next several thousand years training as a vindicator and gladly taking field missions, getting to know and cataloging local species whenever they found a new planet. Both out of a keen interest and curiosity as well as a need to get off the ship and away from other draenei and their reminders. It was on one such mission that she encountered a team of other draenei having a hard time with a local species of aquatic people. She lent her services to their commander, Telurin, helping the team work with the locals for their goals. Afterward, she was formally invited to join the team and accepted. Over the centuries that followed, they became like a second family for her. 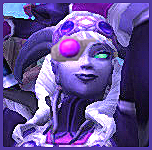 Quite recently, while she was away on one of her field missions, the entire team save the grandfatherly anchorite, Belaar, and his lover, Sio (who were in Karabor at the time), died in the legion invasion on Shattrath. She lost her right eye in a skirmish with demonic outriders a few hours flight away, close enough to see Shattrath burning on the horizon. Currently she remains close to Karabor for Belaar’s sanity, but also for the unexpected arrivals of some of those she lost, from an alternate (the original) timeline, plus a few, beloved extras in the form of alternate Telurin’s grown children, who did not exist in her timeline. Though her old commander is a death knight now, rather than a vindicator, she still has trouble not thinking about each one as her team. A fact that had her more curious about these ebon knights than wary and led to her current relationship with another former vindicator named Kadaan. Tattoos/Markings: Packed and closed-over scar tissue where right eye should be (which she keeps covered with a gem-inlaid eye patch at nearly all times, or a soft cloth one when sleeping), and a jagged scar on her left shoulder. Notes: Even while Isa shares her people’s aversion to demons and warlocks, the fact that she lost her daughter to them when the girl was only 4 or 5 also makes her curious, primarily, if whether the light and love could save such people. This has caused her to take some nervous interest in certain people the draenei would shun. Also, I’ve no evidence in Warcraft that Fey drakes are like the other dragons. I AM interested in the idea, but I have been playing it as though the fey drakes are a bit more mischievous and haven’t let on that they’re not just a dragon-like species and actually have the same intelligence and capabilities of “true” dragons. Character Inspirations: At first, no one really, but now that I picked an actress to play her, she’s a bit inspired by Nicole Beharie’s personal mannerisms I’ve caught in interviews. Nothing specific, but we can talk about it! *I do not own World of Warcraft, Blizzard does. Spoiler Warning: The following profile contains spoilers for my Warcraft-based series, Silent Rain, as it is a profile set over a decade after the story’s events took place. They are written in a light green text you must highlight to read easily. Pictured: Lesara past (left) and present (right) by Mischiart. Voice: Clear and even tones in a soft alto-soprano pitch, usually soft spoken with Darnassian-accented common. She is one of my characters who can sing. Check out this amazing singer to hear how I think Lesara sounds (the first singer). Lesara almost exclusively knows only Darnassian hymns, so even the song works! Her disciplined composure and reserved nature usually show through in her voice as much as her behavior, showing more of her emotion when she sings. You can check the awesome singer out in this youtube video and subscribe to her channel too! Scent: Any variety of herbs or plants, medicinal or decorative and rainy gardens. Pick an herb, fragrant or otherwise and there’s likely a good reason she smells like it at that moment. She spends most of her time in her greenhouse or gardens and enjoys sitting out in the rain. As a healer, she also works with herbs on a regular basis. Appearance: Long, vibrant green hair to her waist in armor of greens and browns with natural leaf, vines, and feather accents throughout. Rarely wears robes any more. Her skin is a pale rose. She has a traditional owl tattoo in green over the bridge of her nose, upper cheek bones, and eyes, and another, older, crescent moon tattoo in purple on the ‘owl’s’ left wing tip. Casting Call: Rosie Huntington-Whiteley. I haven’t seen any movies she’s been in yet, but she definitely has the face claim. I chose this model for a specific reason, primarily because, when prompted to choose a face claim for her, a friend of mine had already created her long-lost twin (fraternal), and picked his face claim. Their colourings are already different, so I wanted to go for a face claim who looked like she could be related to the twin’s face claim. Mannerisms: She has the the quiet, reserved, and dignified baring of one raised and trained with strict discipline in a noble house. This can also make her seem withdrawn and stiff at times. Unless confronted in a hostile situation or out in dangerous areas, she moves and interacts with a peaceful, patient, and warm formality, occasionally with a subtle undercurrent of withdrawn sadness. During confrontations, battle-healing, angry, or navigating dangerous terrain she takes on a more dangerous and almost feral-like demeanor. Work Style: Peaceful, quiet, diplomatic, diligent, and thorough. She can also get rather stubborn. Aggressive, patiently cunning, diligent, and thorough in battle/dangerous situations. Personality: Quiet and thoughtful healer-type. She is a sensitive person though she seldom shows what she thinks, or really any strong emotions at all, having the strict discipline and training that causes her to successfully repress such things from force of habit. Withdrawn and reserved wallflower sort. Skills: Light-based healing and support magic, empathy, diplomacy, gardening, medicinal alchemy and tea preparation, organization, bolstering, supporting, encouraging, mediating, and advising those in need, singing, combat healing, battlefield medic, first aid, emergency healing, emergency life support (and healing, of course), wilderness survival, and guerrilla warfare tactics and assault magics. Relationship Status: Single, probably straight, but definitely very demi-sexual, to the point she’s a 300-year-old virgin who’s never been close enough to anyone to get any sort of urges of that nature. Also on an enforced chastity vow of sorts. Affiliations: Delari Sylvae (loose sort of organization/guild), Dor’elnaar (village outpost she more-or-less leads). History: As Lesara has the most written of her story compared to all my characters, and it’s all stories from her background, her history is thus far, rather extensive. You can read it in-depth anywhere I post Silent Rain (said story): On my personal website, at fanfiction.net, or on Deviant Art. Making it as short as possible, Lesara grew up in a very strict home with a powerful mother. They were one of the matriarchal families in Kaldorei society and Lesara was expected heir and trained as such, but not only for the family, but for her a semi-secret sect of shadow priestesses swearing themselves to the pursuit of knowledge and mysteries, worshipping the new moon aspect of Elune and calling themselves The Order of Mysteries. Not particularly suited to the order, Lesara was nonetheless slated as heir because the high priestess had always been women in her family and the order was created by her grandmother. When the kaldorei lost immortality with the fall of Nordrassil, Lesara’s mother went slowly insane in her quest to get it back by any means possible. 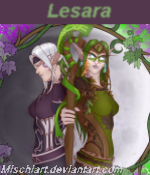 She dragged Lesara along for the ride, by force, through a series of traumatic events culminating in her execution and Lesara’s forced vow of chastity, sealing the end of the Ethala’Aman line, as well as the condition she never be allowed contact with any order activities and must join Elune’s full moon order as a healer, forbidden any activities or magics of the new moon (shadow). She served briefly in Stormwind and Northrend as a healer, stationed in Stormwind both during the pre-wrath event plague and again after that expac as injured soldiers returned to Stormwind in droves from the North. 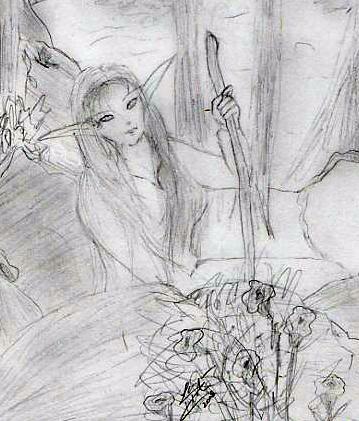 After, she returned to Ashenvale with her father and occasionally her brother, Kalshen, up until the Cataclysm. Ethan was safely in Darnassus at the time, but they lost everything, not to Deathwing’s destruction, but opportunistic orcs. As most of the kaldorei forces abandoned Ashenvale to defend the newly opened Mount Hyjal, Lesara resented their obsession with the world tree (and, presumably, immortality, finding the pursuit distasteful after her mother’s obsession) went AWOL and broke her neutral-minded approach to the horde by killing any orc she caught while defending the Ashenvale forests. During this time she went nearly feral and used the light as a weapon for the first time. Killed for the first time. She stayed at this task until near the end of the Pandaria expansion where news finally reached her of Garrosh’s involvement and actions. She came back to civilization in time to join the alliance vanguard, served for a time in Gorgrond very much the way she fought enemies in Ashenvale, before finally receiving leadership of an outpost settlement in Shadowmoon Valley. Tattoos/Markings: Traditional owl tattoo in green over the bridge of her nose, eyes, and up on her cheek bones. Older, scarred-in purple crescent moon tattoo on the left side of her face, curving toward her ear. Character Inspirations: Not particularly anyone, actually. Personality from my own head. Started off as an Azerothian version of an original minor character I created for an original fiction story and grew from there. Same name. She was supposed to be a tragic character who served as an unrequited love interest from legend. So I suppose you could say she was born to be a tragic character. She grew far beyond that though and is now a different character within that same original universe, but with a similar sort of past and personality to Warcraft Lesara. *Transitions (the primary art used) was a commission work Mischiart did for me up to my specifications and beyond. *I did draw the sketch, with traditional paper and pencil, using a photograph of one of my best friends for reference, darkened in photoshop (it was a light sketch). *I’m not sure who owns the rights to Rosie’s (the face claim) gif, but it does not belong to me either. The Original Bean. The Rena Bean. Hyper Bean. Happy Bean. Random Bean. Build: Wirey and athletic. Not very curvy. She could pass as a boy in the right clothes. However, any visible muscles are well-toned (but not bulky), especially her legs. Voice: Small, but energetic voice in the soprano range (though she’s just okay at singing). While her common is primarily accented in the style of the Southern Eastern Kingdoms, it also holds the hints of various accents one might expect from someone who’s spent the last half of her life among kaldorei, dwarves, and gnomes on a daily basis. Imagine the speaking voice of the singer in the theme song and that’s about what she sounds like. Scent: Ocean/beach (most likely) but possibly oil and/or parchment. Depending on how recently she’s treated her hair after swimming/diving her hair may smell of an herbal mixture that includes honey, buttermilk, and eggs (basically, honeycakes). Appearance: Rena is a somewhat short, wirey young woman who is almost always smiling and rarely sits still for long. She is not nearly as well-endowed as the game makes her out to be. In fact, with the right clothes, she can still pass as a boy. Where visible, it’s obvious her body is well-toned, especially her legs. She keeps her orangey-red hair swept up in a messy bun for the most part, though it may also be loose or in a pony tail. The length stretches to her hips and is mostly straight. She has the sun-streaked hair and tanned skin of someone who spends a lot of time outside. She always wears a section of her hair in an inch-thick braid starting behind her left ear and stretching to her hips. 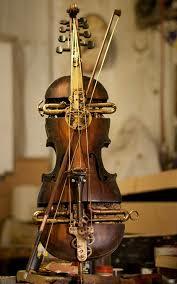 It is tied off with dangling bits of gears in a variety of metals and sizes. It looks like an engineer’s charm bracelet wrapped around a braid with no single gear larger than a copper piece (gear charms not as pictured on the right, unfortunately). Face Claim: Whoever this red-head is. If you know, please tell me! Mannerisms: In social situations she can be a bit self-conscious, but it’s usually trumped by her desire to make people smile, though she’s offbeat and fond of mixing idioms and sayings to a confusing end and just comes off as a little weird. She habitually ends sentences with the phrase “y’know?” where it makes sense. Personality: She is a kind, upbeat, happy-go-lucky individual with a lot of spirit. She tends to put other people’s happiness before her own, sacrificing her own wants and needs when they contradict the goals of someone she cares about, and she cares easily. The exception is when the contradiction is a matter of ideals and morals. She just wants the people around her smiling and has gone out of her way to make it happen. Despite all of this, she also deals with social insecurity that’s more obvious during first impressions and more hidden when you get to know her. Can be a bit erratic and impulsive. Also an adrenaline junkie, but she doesn’t take unnecessary risks and does not have a deathwish. Strengths: Creative, spirited, optimistic, caring, honest, loyal, dedicated, can-do attitude, inventive, good humor, and sincere. She is also careful, fastidious, and responsible in her work, particularly in jobs with hazards. Weaknesses: Restless, socially insecure, difficulty expressing herself, naive, doormat, impulsive, unpredictable, flighty, dissociative tendencies in confrontation/tragedy, distractible, and gullible. Skills: Empathy, violin, engineering, research, archaeology, specializing in underwater excavation and artifact recovery, scuba diving techniques, equipment, and safety protocol with experience in the more advanced (and dangerous) cave diving as well, can defend herself in a fight, speaks fluent Darnassian, conversational Dwarvish, and fluent Gnomish (which she can also read), and turning frowns upside down, understanding nautical charts and schematics, mosaic photography, archaeology work also includes studies in paleoethnobotany and zooarchaeology. Pets: Glitchy, a mechanical squirrel and her first engineering project. Relationship Status: Heteroflexible; in a serious, polyamorous relationship with Ehrendil El’shalla and Tulosa Dru’Isyl. Pictured left. Religion: Nope. Has an unexplainable aversion to the human worship of the light and their priests. They make her very nervous. History: One of many war orphans. Remembering almost nothing about life before the orphanage (too young), Ren can be rather obsessed about discovering lost pieces of any history because she knows nothing about her own and has no way of finding out either. She was given direction early in the orphanage when she met a wandering gnome named Praicee and picked up her “odd” habits with gadgets. However, the orphan’s home she lived in wasn’t very good and she ran away at the age of 10, dressed as a boy named Ren for her own safety. She eventually stowed away on a ship bound for Kalimdor. She ended up staying with a kaldorei family until their matriarch returned and forced her out. After this, she stowed away on a kaldorei ship called the Tal Shanre where the captain, Tulosa Dru’Isyl took her on as an official cabin boy (still posing as a boy). She has spent quite a bit of time on the Tal Shanre since, though Captain Tulosa eventually connected her with gnomes and dwarves to pursue her interests in archaeology and engineering further. She still occasionally works on the Tal Shanre as either an engineer or diving expert, depending on which is needed for a particular mission. She has spent the last 9 years studying and improving her engineering and archaeology with a focus on field work that allows for her other two loves: Exploration and scuba diving. Character Inspirations: Rikku from FFX. Primarily. She’s just such a fun character I couldn’t help myself. 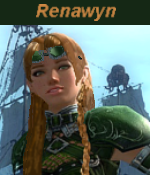 Renawyn was created specifically with Rikku’s personality in mind, originally. There’s still obvious nods to the younger Al Bhed girl, but after almost a decade she’s grown into her own character. 2. Any of her gnomish or dwarvish teachers and/or colleagues (engineering, language, or archaeology related). Any of her diving instructors/colleagues. 3. Ren is actually fairly easy to connect to, let’s talk about it! *I do not own Guild Wars 2, Anet does. Another World of Warcraft RP character I play. Build: Athletic, works out, but also lean; more of an agile physique than one of raw strength. Because I took the test for him and only a few details in his result fit, the rest were way off and I couldn’t find any of the other results that fit either. He’s a mixture of several. Character Inspirations: Despite all the Eric Balfour/Duke Crocker inspirations/references, this character is not based on Eric’s Haven character (Tulosa is older than Haven). Originally, this character was played by a friend who gave me permission to play a version of the character he’s no longer interested in. He kinda took on a life of his own, quite by accident, in googledoc RP and is now one of my mains. He’s a mix of that old version of my friend, Dareld R.’s character, my own additions, and is (recently) heavily influenced by the character, Duke Crocker, played by Eric Balfour on Haven. 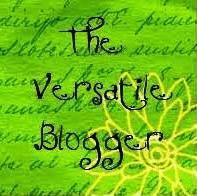 Voice: Weighted and laid back quality. Though he speaks loud enough, the quality is soft, casual, and in the tenor range edging into baritone. His tone is warm with good humor by default. Scent: Salt-soaked wood and the sea. Appearance: Dusky purple skin, eyes are a pale-gold glow, edging into silver, and midnight-blue hair to his hips (much longer than the pic to the right. He usually wears it back in a tail and keeps his facial hair trimmed in a thin mustache, light beard, and goatee. For a male kaldorei, his eyebrows are rather tame, rather than bushy and he has a very expressive face, usually set in some variant of a smile. So much so he even smiles a certain way when someone tries his patience or irritates him. When he really smiles, it almost takes over his whole face. Mannerisms: Laid back, casual, possibly even lazy sorts of gestures. Though he moves with a fluid ease and light step when in action. He has a tendency to talk with his hands a lot. Personality: Easy-going guy who also has his cocky and sarcastic moments. He cares more than he lets on, which is most obvious when he comes across someone in trouble and, despite having a casual reaction to their plight, ends up helping them like its no big thing, usually in ways that have some obvious personal benefit to avoid looking like a bleeding heart or making the recipient feel like a complete charity case. Despite all this, he also tends to hold most people at arm’s length, keeping a mostly friend/professional relationship. He’s a private person who’s more comfortable keeping an eye on things than being in the middle of them. Despite his casual, laid back attitude, he tends to take matters more serious than not and usually has far more on his mind than he shares. As a leader, he treats his crew as equals, garnering loyal respect with them rather than boss and underling. Given his propensity for making crew from people who need a hand up in life, he rarely needs to reinforce order or respect for his authority. Skills: All skills necessary for sailing, captaining, and maintaining a sizable ship, organization, plays guitar, good with people, observant, disarming personality, assassin reflexes, rope and knot work, throwing dagger use, agile, information gathering, networking/establishing connections, fluent in several languages (Darnassian, Common, Thalassian, Orcish, Pandaren, Goblin), and conversational gnomish, dwarvish, troll, and combat that plays on his strengths (agility, fast and practiced movements that rely on precision, timing, and holds that disable his opponents and/or use their own strengths against them, as well as slipping out of holds), lock picking, various rogue/assassin skills. Relationship Status: In a polyamorous relationship with both Ehrendil and Renawyn as a trio. Bisexual. Pictured left. History: His memory is full of holes and not everything he does remember is real. Former assassin/spy for a secret order of kaldorei shadow priestesses who were fond of wiping and manipulating memories. 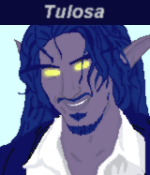 Tulosa’s has been wiped and manipulated so often over the last millenia as one of their shadowsworn that they let him stay retired after they found out he was still alive (he was declared dead after his original crew mutinied almost two decades ago). His head is sometimes a mess of fragmented memories that give him frequent nightmares. His personality also seems patchwork to the point I can’t even get the MBTI to give him an accurate read. He was not a willing shadowsworn and tried escaping the order many times previous. Thanks to his basic personality as a generally caring sort of guy (which they used to get him close to targets), they also needed a mental trigger to shut off his emotions during assassination orders. This trigger has since been removed by a kaldorei justicar named Antagonis Na’Mhorym. 1. Left shoulder/upper bicep: 3X3 inch Artistic rendering of the kaldorei symbol for memory ripped in jagged pieces. 2. Left inner arm: Decorative kaldorei script that reads “Don’t go where the path may lead you, but instead go where there is no path and leave a trail behind you.” verbatim Eric Balfour’s as pictured on the right (yeah, I know, hard to see). 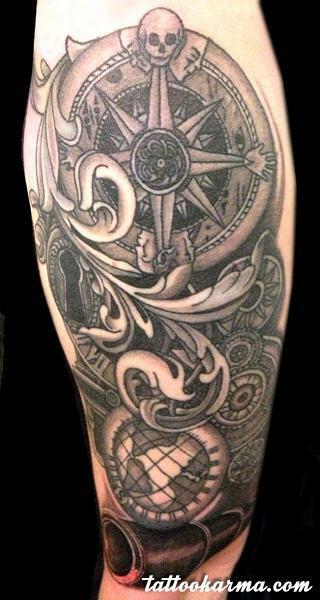 Eric’s tattoo seems to have little wheels or flowers of some sort (I’ve not found a clear enough picture yet). Tulosa’s, however, is just decorative script. Pretty much exactly like the one pictured on the left, but on his other arm, starting all the way up on the shoulder and ending before the elbow. Obviously the picture of a globe at the bottom of this tattoo contains outlines of Azerothian features, rather than Earth continents. If you can’t tell in the details, the vaguely circular shapes under the three main features (compass rose, kelp frond, globe, and spyglass: On the left under the compass is a keyhole in a circle, under the compass on the right is a coin decorated with a sun, the larger circle somewhat under and just above the globe to the right is a flat representation of a Kaldorei astronomy globe, the smaller circle between the two is a ship’s wheel. 4. Centered over right hip bone: about 4 ½ inches tall and 3 ½ inches wide – an anchor with frayed, severed rope and a scrolled strip of paper up top that reads (in kaldorei script) “Neh tu kare” and another scrolled strip of paper at the bottom that reads (in kaldorei script) “Talond tu saril” which I have designated as meaning “Cut the rope” and “Leave the anchor” A little like the tattoo below, but thicker anchor, better, tattered rope, something more old and textured looking rather than so smooth. Bonus: This amusing video has both mannerisms, face claim, voice, and tattoo location references (with the exception of the hip tattoo). He’d be the guy who ends up in his underwear. Lots, both remembered and forgotten. We can talk about it! There really are so very many options with this guy. *Some of the original Tulosa and his background, including his name, was created by my friend Dareld Reynolds; used with permission. *None of the tattoos have a proper source, sorry. They are not mine, I did not do them. *The first picture is a paint-over I did to turn a Haven still of Eric Balfour into a kaldorei. Rights to the original source image belong the the creators of Haven. *I’m not sure which Eric Balfour movie the script tattoo is from. *Anchor-background headshot commission piece was made by Sir Meo. *Rendilosa trio hug picture by art-by-g.
“You’re SO weird!” Jeylie chided, her tone snide. Rena poked her head out from under the bunk bed and found the other girl looking down at her, dolly held tight. Oh, me…again. She sighed, hoping maybe someone interesting had just walked in. “What are you doing UNDER the beds, Weirdena?” Jeylie sniffed and looked down her nose. “Bein’ creepy!” Jake, another of the orphans, answered as he walked in, laughing. “Rena-Weirdena-Queen-a the strange!” Steve sing-songed, snickering at his rhyme. Blushing, Rena ducked her head under the bed, holding back tears while she sorted through her little metal treasures; broken watch gears, bits of wires, and metal scraps. All these wrong parts held the mechanical squirrel schematics a visiting gnome gave her a few years ago pinned and unscrolled on the blanketed floor. “At least I’m royalty,” she mumbled. The other orphans continued mocking her and laughing while she tried blocking them out. Rena closed her eyes and shook her head before nibbling on her bottom lip. She worked for weeks on that doll, even exchanged her monthly treat for a bottle of specialized glue. Jeylie threw it away. When Rena looked for it later, the others started calling her a garbage picker. “I just want them to smile…” Ren whispered in her own made-up language. The fat black house-spider up in the corner of the bedpost obviously understood this language. She confided often enough in that spider since she found it a few months ago. ‘They are smiling.’ She pretended the spider answered, the poor little insect not understanding the difference. “UGH!” Jeylie said in exaggerated disgust. “She’s talking to herself in that creepy language again!” The other girl retreated from their bunk. “Who’s she talk to anyway under there?” Jake sneered. “Her imaginary friend.” Steve giggled. “She’s not imaginary!” Rena looked up at the spider. “A spider? 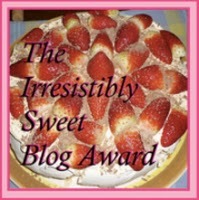 !” Jeylie followed her shrill question with a tiny squeak of, “under my bed? Maaaaatrooooon!” And the sound of her footsteps and crying running outside. From the sound of it Jake and Steve followed. It was the last Rena saw of her only friend. The matron squished her with the toe of a shoe. Soooo, on my RP character tumblr, someone asked if there was a story behind Rena’s lack of confidence in social situations. This is just one of those stories. Been a while since I’ve updated my blog, so thought I’d update with this. Awfully close to maybe picking Silent Rain up again, at least to finish it off, even if people have lost interest in it. The following is a short scene based in the game, World of Warcraft, featuring my draenei paladin, Iisala. She is from the alternate Draenor. Pictured to the left, post-eye-patch. Not edited, completely out of the blue for a writing exercise, and tied in with a friend’s story, but hopefully enjoyable. 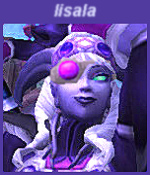 With only one eye, Iisala watched Shattrath burn. The other wept blue streaks of blood through the soaked cloth she held pressed against it. They were still in there, nearly the whole team. So many children and innocents as well. She whispered a prayer to the light, feeling only the faintest response, not enough for anything. It left her far more hollowed out instead. She sighed and tossed away the soaked cloth, flicking excess blood from her fingers. Keeping her eye squeezed shut, she wrenched her sword free from the last demonic outrider who ambushed her, the bodies of he and his fellows much worse off than she. The injured eye burned hot enough she barely felt her other wounds, though she limped and one arm hung useless at the shoulder, thankfully not her sword arm. The last demon’s sword hit hard enough her pauldron cracked, the jagged edges stained blue with her own blood. Gritting her teeth, she flung the remaining demon blood from her sword and sheathed it. She growled at the resulting pain from her other shoulder. Shattrath continued burning in the distance behind her and she turned for one last look at the sickly green horizon. Tears seeped from her other eye, blurring it all out as she looked up at the starlit sky directly above her. What do I do now? She pleaded, hoping for a comforting chime. Better yet, to wake up. Surely some made it out? The attack was so swift she really didn’t see how. It was only her luck she was just returning and decided to camp out for the night while she was still a few hours’ flight away. The city was lost, and though she felt the impulse to rush in regardless, she whistled for Erijaa, her fey dragon. Better to warn the outposts from the air and report directly at Karabor. Belaar…how will I tell him? Erijaa came crashing through the bushes to the edge of the overlook, streaked with fel blood, but uninjured. “We cannot stay here,” Iisala murmured as she calmed the beast and pulled herself with no small effort into the saddle. She then wrapped the reins around her arm in such a way that she could unlatch the small warhorn attached to the front of the saddle, sounding it near every outpost along the way. When Erijaa finally dipped low in the sky for Karabor, Iisala jumped and then stumbled off her back before the landing even completed, heading in for direct report. She pulled another spare bit of cloth from her tattered cloak and held it against her eye. The room began dancing around her and a new pain in her knee registered that she fell forward on it. She also only just realized she continued reporting details, though either coherency was lost in her slur, or she ceased comprehending her own words. 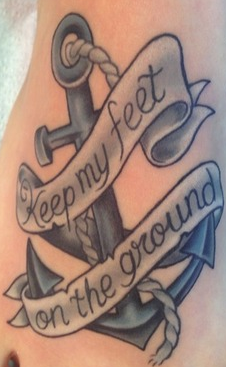 “Get an anchorite! NOW!” She heard an angry male shouting in her ear just after deciding the floor looked like a most welcome bed. A nap might do her good about now. The warmth emanating through her shortly after she laid down felt comforting, though not enough to stop the now-dull aching in her shoulder and fire in her eye. A chiming lulled her further into sleep. Where was it before? “Tell Belaar…I’m sorry. I’m…so sorry, baji.” She let go then, floating in a dreamless light and warmth. Notes: A friend created both Belaar (who she plays) and the story of the team Iisala joined and shows concern for. Baji is a term we came up with together, it is a term of affectionate respect, something like calling an unrelated old man “grandfather,” but not quite. I’m assuming Belaar is pronounced Bell-ahr. Strengths: Willpower, Self reliant, intelligent, mimicry, impersonation, fading into the background, suspiciously tough psychic defenses, subterfuge, unpredictable, planning. Weaknesses: Interpersonal relations, withdrawn, secretive, distrustful, cynical, suffers from PTSD, occasionally unstable and unpredictable, anger issues (though adept at hiding them), a certain female night-elf priestess who set sail without her, unreliable, manipulative. Appearance/Mannerisms: Her mood is difficult to read as her expression is usually a careful mask of neutrality. Her posture and movement is fluid, suggesting a relaxed and unworried state. She appears as she is in-game with one exception, the pony tail is actually a thick braid that stretches just past her hips. Generally Native American in appearance, with a bit of an unfriendly look to her. Her scent is mostly indiscernible from the outdoors, but those with stronger senses of smell might detect the earthy undertones of morrowgrain in specific. She habitually chews on the end of a morrowgrain stalk the way one might smoke from a pipe a few times a day. 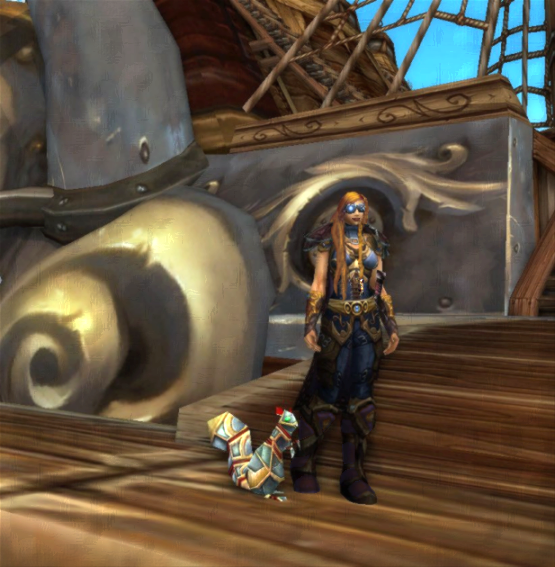 History: Only one person knows much about the real Gida and her history and she set sail for uncharted lands a year before Deathwing’s cataclysm. You may find fragments out from other people, but not much to go on. She carefully cultivates a lack of reputation, though those who’ve actually met her outside of a job might describe her as cold and aloof. Her death was ordered after she pulled a Xanatos gambit to expose a rather influential lord. Having something of a reckless death wish for a while, she risked discovery to take down this lord successfully. If he was defeated, it was another successful mark. If not, she would use herself as bait and force the lord’s hand. If she survived, she could fake her death, if she didn’t, his move would cause his own downfall after her death. Officially on record, it was this last that happened. Work Style: Gida pairs her gift for impersonation and mimicry (occasionally bolstered with alchemical potions) with her intelligence to take down her marks from the inside, often pushing them in several little places as random, overlooked people (such as an old servant woman) until they end up causing their own downfall. She also uses several different disguises to obtain as much information as possible before coming up with a plan and revising it as needed. Notes: I play Alasgida as a few different characters. Keep an eye on outfit and MRP changes for who I’m currently playing her as. What this means is, if you meet Gida, you won’t then recognize her as Gida when meeting Talon and vice-versa. Considering Gida’s status is currently listed as dead (as of the cataclysm), it is quite unlikely you will meet her. Alasgida may never make a reappearance as the core personality of the character, despite carrying the name still. It depends entirely on whether or not Blizzard fixes her face to my satisfaction. So, please, do not roleplay as though you know this side of the character is there. Her primary talent is impersonation and she is very thorough altering vocal pitch, scent, mannerisms, accents, contouring make up, and more tricks in her arsenal. She’s been at this for decades and is rather practiced (she is older than she looks thanks to a previous RP story line’s results). Besides, if Blizzard never fixes her face to my satisfaction, then Lynn/Talon will be an actual character rather than just an impersonation. 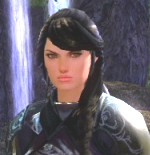 This is also why she’s primarily represented in the images from GW2 which comes the closest to looking like her than any other version. Tonantzin Carmelo, courtesy of IMDB photos. Click to view her profile there.